NASA's Lunar Reconnaissance Orbiter (LRO) experiences 12 "earthrises" every day, but it recently took full advantage of an opportunity to capture this image of Earth — and it's marvelous. Normally, the LRO has its camera pointing down on to the lunar surface. 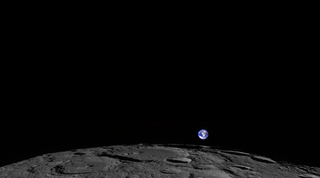 But in this instance, NASA scientists had it pitch forward while approaching the moon's north pole, allowing the LROC Wide Angle Camera to capture Earth rising above Rozhdestvenskiy crater (112 miles [180 km] in diameter). When processing the image, however, NASA and Arizona State University scientists chose wavelengths that match well with the human eye, so the colors are very close to true. This is what the average person might actually see. Additionally, the relative brightness of each object is correct. And as you can see, the Earth is considerably brighter compared to the moon. Image Credit: NASA/Goddard/Arizona State University.